In todays changing operational environment, innovative solutions are necessary to solve cooling water treatment problems. Regulatory, environmental, and competitive pressures are driving plant management teams to be creative in solving these challenges. ED 2000 answers these challenges with our non-chemical cooling water management program featuring an integrated series of treatment technologies called ED 2000. The ED 2000 Multipure System, combined with the Guardian monitoring and control system, represents a compilation of the most technologically advanced components available for managing cooling water non-chemically. Each component has been thoroughly developed and proven in the field to perform its unique function in the safest, most effective and environmentally sound way possible. When combined as a water treatment system, each component complements the others and works in concert to control scale, microbiological growth, corrosion and fouling. However, the goal of the ED 2000 Multipure system is not simply to replace the chemicals typically used to control these concerns, but to make cooling water perform more efficiently than ever before. 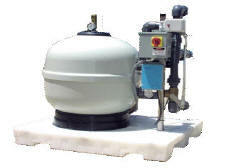 ED 2000s skid-mounted total treatment package is comprised of the ED 2000 Multipure and the Guardian Monitoring and Control System. The ED 2000 Multipure includes three proprietary components to address scale, microbiological growth, corrosion and fouling. Each component is technologically advanced from a performance, efficiency and control standpoint. The technologies have been designed to work together to achieve an effective solution to combat cooling water treatment concerns. 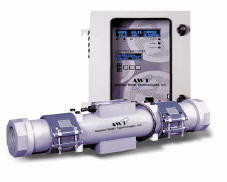 ED 2000 Ironman Filtration System Advanced technology combining cyclonic action with multimedia filtration removes fine particulate matter from cooling water systems while also conserving water. ED 2000 Ionization Biocontrol Unit Maintains a precise but very low residual of copper/silver ions throughout the circulating water system that is lethal to microbiological life. ED 2000 Anti-Fouling System Solenoid Induced Molecular Agitation produces a controlled precipitation of hardness ions that continually softens cooling water with targeted protection of key components from scale formation. Guardian The Guardian Monitoring and Control System enables continuous monitoring and control of key system parameters as well as the ED 2000 Multipure components remotely and in real time.